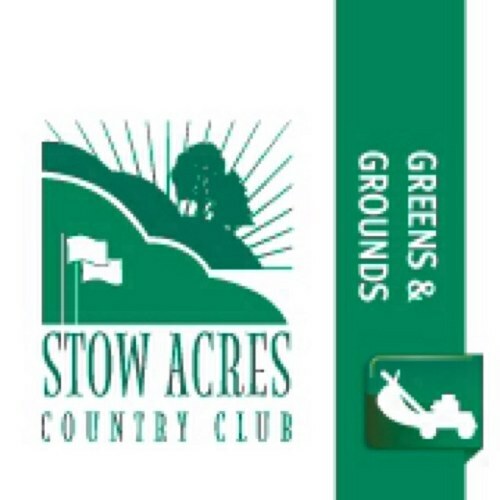 Stow Acres has been open for just about a month now and the courses are truly starting to show the hard work that the grounds crew has been putting in. We seem to have pretty much fully recovered from the massive amounts of rain we got a couple of weeks ago. There are still some damp areas scattered throughout the course such as 4 South, 18 South, 4 North and 6 North but all of the greens complexes are open and playable and now both courses are allowing golf carts. As a reminder I’d like to ask all golfers to respect all of the roped off areas as well as the carts signs throughout both courses. Earlier this week the grounds crew completed aeration on the South Course greens as well as both practice putting greens. As an intern, this week I had my first realization that I was no longer just a regular member of the crew, but had started to delve into the practice of actual turf management. As opposed to last year when I would be required to go and cut greens or fairways, or go rake the bunkers, this year I’ve begun to take on more crucial tasks and greens aeration was the first major example of doing so. We started Monday morning with the front 9 South early in the morning by punching cores in the greens. We punch cores as a way of loosening up the compaction in the soil. Throughout the year the ground gets compacted due to foot traffic and from mowing and as a result the natural pockets of oxygen in the ground get crushed making it harder for the grass to receive oxygen. 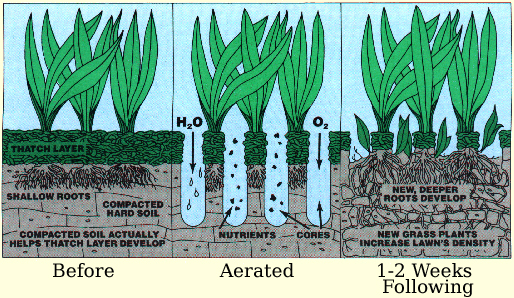 Also, because of the highly compacted soil the roots of the grass have a hard time growing and nutrients cannot not interact as well as they should. After punching cores, as a crew we push the cores off the green, scoop the up and remove them, and them proceed to blow the remaining soil and leftover cores off of the green. This makes sure that the holes we have punched remain open for the next step in the aeration process. Once the greens are cleared we topdress the green with a very fine grade sand. We then spread a low nitrogen organic fertilizer on the greens. After that we go over the greens with a drag mat and large turbine blowers so that the sand and fertilizer is pushed into the coring holes. Once the sand and fertilizers have filled in the holes we spread more organic fertilizers. Finally we pro-seed the greens with a creeping bentgrass mix so that a new generation seedlings may flourish and replace the shoots that are lost through core punching as well as those that may die naturally throughout the year. Once all this is done we water the green heavily so that it may recuperate from the stress it has incurred during the aeration process. It’s a long and arduous process but once the greens heal up the results are amazing. Without aeration, which we also do later in the fall, the greens wouldn’t be able to survive over the years. This insures that the greens remain healthy and playable for years to come. What many would consider the hardest work days there are on a golf course, become much easier when you realize the incredible amount of good you are doing for the turf. When it comes down to it, what you’re really doing is aiding in the survival of a living organism, and the feeling you get from doing so is enough reward to make those tough work days seem a whole lot more enjoyable. We will be aerating the North Course greens on Tuesday the 20th and Wednesday the 21st of next week.